Add color and protection to your home or farm with painting supplies from H&M. We sell indoor and outdoor paint for any project. 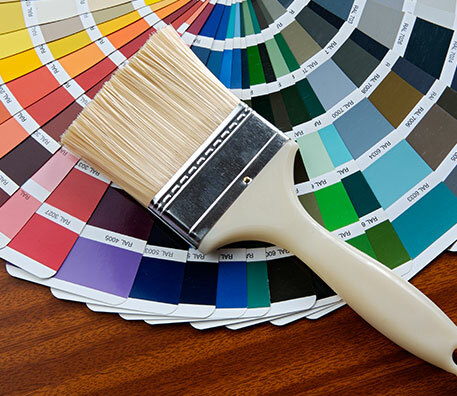 Whether you're looking for spray paint or wood stains, you'll find it in our paint department. Don't settle for anything less than perfection. We have a computerized matching system that makes it easy to recreate whatever color you bring us. Not all paint is created equal, which is why we are proud to offer Valspar products. These paints are known for their beauty and durability, and they are available in a variety of finishes to suit any project. We also carry KILZ primers and sealers that ensure lasting results. Stains do more than make your deck look great — they also protect the wood from moisture and deterioration. Our products include Minwax wood stains and Cabot premixed DeckCorrect, which breathes new life into aging decks. Protect your farm equipment against rust and scratches with a tough coat of paint. We sell enamel tractor paint from Van Sickle and spray paint from Rust-Oleum.